A card is chosen by the spectator and signed by them. It is subsequently lost in the deck. Then, a dart is displayed. This dart is shown to pierce objects (sheets of paper/expanded plastic). The cards are dropped on the floor, and are spread around. You aim the dart at the ground and let go, attempting to pierce the selected card. 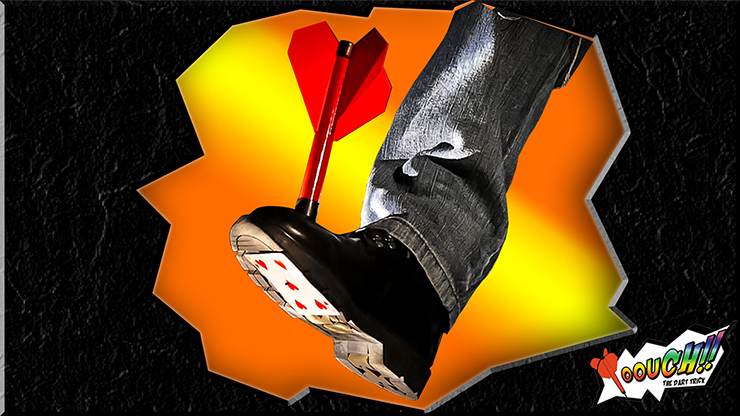 Unexpectedly, you make a mistake -- you pierce your own shoe with the dart! You will hear instantaneous screams and excited yells from the spectators! Finally, when you lift your foot, the signed card appears with a hole, which wasn't there before! This can be used on stage or you can modify its size, if needed, to carry it in the inner pocket of your jacket. You can prepare this in only "20 seconds." It can be used with different shoes!